G-CAS! Sew Excited! : I'm on the Fence. Hmmmm! I'm on the fence about this outfit. I'm sure you have been in this predicament. When you make (or buy) something and then you're not quite excited about it when it's all said and done. Well, here it is for me. I originally made this outfit to wear out "steppin". The color theme was Grey. (Yes, I said it "color theme".) It's actually kinda cool. The color is advertised for the party and all the "regular steppers" and "club members" show up in the color for the night. You have not lived until you have seen a ballroom full of African American men dressed in Yellow or Lavender suits/outfits that look quite masculine and all different! (with shoes to match!) LOL! Anyway steppin is a partner dance we do here in Chicago - ton's of fun and part of the fun is dressing up in "custom" clothes. Well this outfit looks "made". 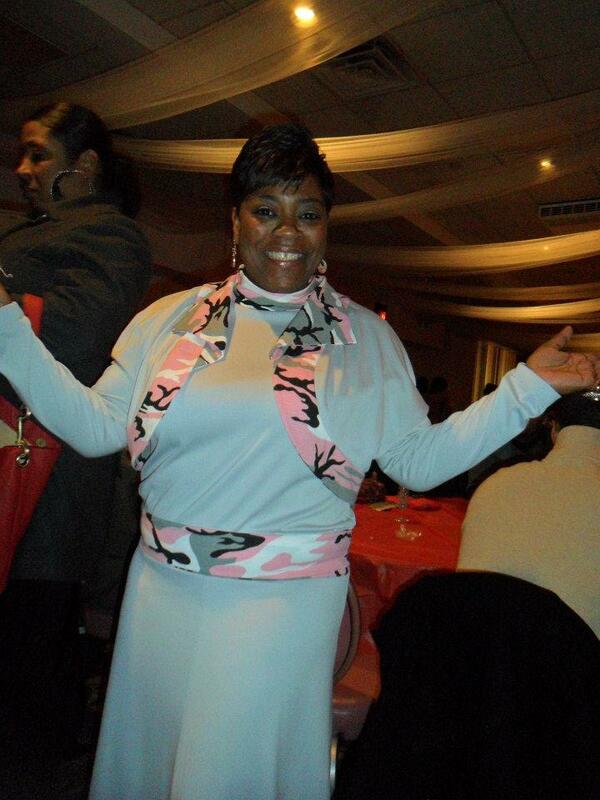 I like my clothing to look RTW but this has the "I had this made for the grey party" look. I'm not real thrilled. Now, as separates - I'm sold but I think together it may be to much. Although "To Much" is what steppers do. I chose to review the jacket as it has not been done on Pattern Review. This is a little Bolero Jacket with neckline and sleeve variations. I thought this would be a nice jacket as I thought the outfit needed something more. I have added a photo of the outfit with the turtle neck and skirt only. Please pardon the bad photos. My camera is broken and you are looking at cell phone quality! LOL! I don't think this bolero is for a beginner per say. Adding the band takes a little more experience. Advanced Beginner would be able to tackle this. Jacket front and side. Sleeve detail. Turtle and skirt up close. 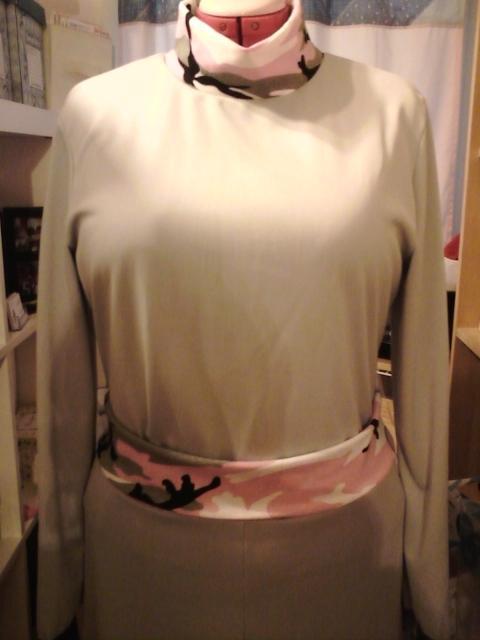 The fabric is pearl grey dry weave knit and the camouflage print is jersey. It's grey, black, pink and white. The pink is vibrant like bubble gum. (smile). The fit is good on all the pieces but I need shoes. (Since I'm thinking shoes, I may just save it and wear it to the next "grey" party. I won't do "separates" because then it will be "old" LOL! I like new clothes. I ended up wearing black suede boots so here I am in the outfit! It worked out after all! I like it. I think it is a good finish for your garment. So wear it. You have been told. Is stepping like hand-dancing that is done in the older D.C. clubs? Sometimes I'll see a few older (like in their 60's) black couples hand-dancing at swing dancing clubs in D.C. Great to watch! My honest opinion is that the turtleneck isn't quite right. The skirt and jacket are a bit prim, I think a more daring top would be better. Maybe a camisole or a drapeneck top in the print. As for shoes, if you can dance in the high heeled ones, go for it! They are super cute. I would brake an ankle trying to dance in them. If this were my outfit I would put black trim along both edges of the camo fabric.I like the heels.